It seems like bezel-less is the trend nowadays because after the Nubia Z9 and the Oppo R7, we now have yet another handset with such a design. 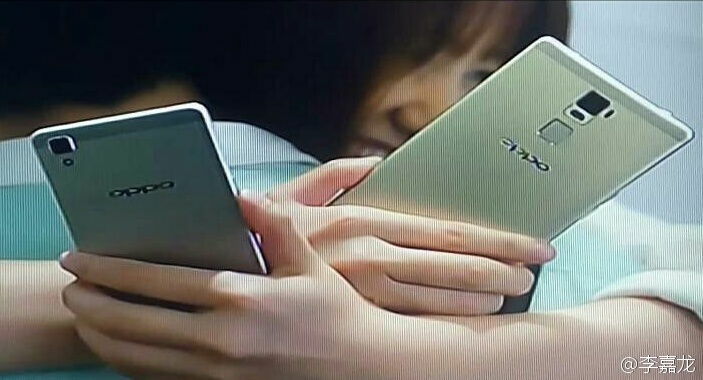 The Oppo R7 Plus is the bigger brother of the R7 and it sports a fingerprint sensor as well apart from the similar bezel-less design. The phone is bigger than the R7 in terms of physical size and screen size. It is still made of metal and has a fingerprint sensor on the back. The camera has unit is relocated to the top center and is now accompanied by what looks like a Dual LED flash as opposed to the single LED flash on the R7. The front shot of both the devices also shows that the R7 Plus doesn’t have the capacitive hardware buttons like its sibling, the R7. Instead it is replaced with “oppo” branding and will most likely use on-screen keys. The Oppo R7 was officially teased last month and is set for an unveiling sometime this month. The R7 Plus is also rumored to be announced alongside the R7. Not much else is known about the features or specifications of the device but we will let you know more as and when information arises.